Hello people! So sorry for the long hiatus (2 weeks?)! This would be a post solely reserved for sermon sharing on last Sunday, and I would include some of my afterthoughts after the sermon. 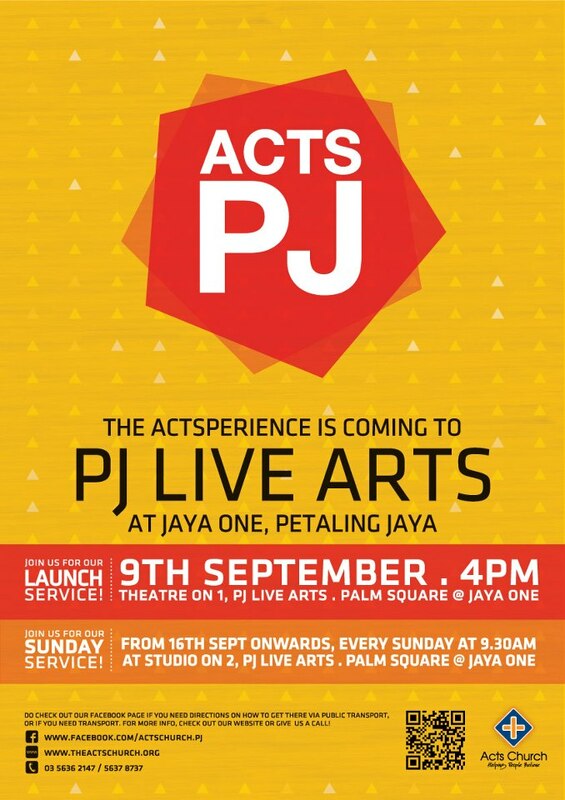 But before that, I would like to announce (if you have yet to know), Acts PJ has been launched on the 9th of September (last Sunday) at 4pm! Woots! It is a new church plant of Acts, serving as an avenue for God to move His hands even greater to bring more people to Him, to bless the PJ community by making the church more accessible for the people. 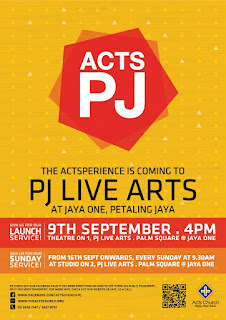 Again, congratulations to the startup team of Acts PJ! They have really sacrified a lot and their obedience to God's mighty plan shall be applauded! - It's easy to bring people out of Egypt, but it's hard to bring Egypt out of people. - We belong to God, we are made in God's image. - Forgiveness, patience and faith are beautiful. - Church need to give second chance to people, as church has received second chance. - Everyone wants a second chance at least once. - God is God of Second Chance. God and the world is direct opposite. Once upon a time, we were our center of life; Now Jesus & God are the center! We are IN the world, but not OF the word. Kingdom comprises of a King, people and the ways. With fear of God, we obey Way of God (higher law than world's). If you chosen to be bullied because of obeying God, blessed are you! We go against the Earthly flow. It's a choice, not a chance. If you are obedient to God, reward will be yours. - Challenge the church to be irresistable. i) Grow spiritually in this church (full in spiritual food). ii) Witness a strong sense of mission/purposes (to care for the poor & community). iii) Long to go to this church every week. iv) Want to invest in the church for a long hawl (get involved!). v) Want to tell others about this church. vi) Feel relax in the church (don't feel judged & condemned but feel loved and warm acceptance). vii) Delightfully challenged (Word of God challenge me to grow, beyond myself, to be better). - Church is not a building, but the people. - Our first purpose is to be irresistable to God, not to people. - Be a church that feeds the hearts, not only mind feeder. - Stay away from arguments that don't change life. - Irresistable is not perfect, but alive. - It's the presence of God that draws people to church. - Beatitudes attract God, hear Heaven's applause. - What draws Him is call Him from the inside out. - Be magnate for God's presense. - It's living to please God that brings God down. - Finish a degree/study with not only title, but a testimony. - We live to please the Lord. - Holy Spirit will baptise you through fire. - We must be people of Holy Fire. - Fire in Greek called 'pur' (also means lightning). Wow! What a great conclusion for the Survival Series by Pastor Kenneth! One thing that I need to testify, is that God is really faithful and gracious to me. It's really true that when a servant of God is obedient, God will graciously reveal lots of great plans to him or her, and make the journey smooth despite some random trials and tribulations. Everything will be good in the end as God has assured us that if it's not good, it's not the end yet. Only by living with God as our center of life, He will draw close to us delightfully. 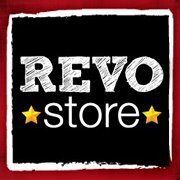 I has served Revo Store for a month now and thanks to the Revo Store team, I have technically learnt most of the tasks involved such as MTG order, MTG collection, sales, cashier and assistant cashier! So I will write down a summary just to refresh my memory, hoping that I would be able to remember how the operations of each task work in future. When Revo Store team sets up the stall, first we need to count the opening stocks available, filled up the form and put some of the stocks on display. to fill up the MTG form, put a signature and kindly ask him/her to pay at the cashier. the codes of items are, and make sure you return the right amount of money to the person. H2O and books etc are less frequently bought. Close the counter, and recount the money. Make sure it aligns with the sales record. with receipt, then return it to the 'customer'. Another door that God is opening to me now is Acts London! I'm getting excited whenever I hear of Acts London, and has already joined the Acts London Support Group in FB. London will be my home for the next 3 years, and it would be really great if Acts Church could plant a new church in London. For the past 9 months I have spent in Acts Church, I'm deeply attracted by the church's warm acceptance and God's presence in this church. I still remember there was one occasion when Ps. Kenneth was praying for me during the alter call, he prayed that I would be able to forget my past, which left me pondering deep about it. My past? ... I'm a 1st Generation Christian, with my older sister and parents being Buddhist/Taoism (Praise God that my younger sister is a Christ believer now!). Hailing from a Buddhist/Taoism background, I wasn't really that fervent about teachings of Buddhism. I was self-centered, just like many other people who have yet to know Christ. I didn't have many friends during secondary school due to my personalities (selfish, pride, inconsiderate, kiasu, unforgiving etc). Some of the traits I believe I haven't fully improved but I'm working on it... with Christ! I was a school prefect in my old secondary school, but ironically a victim of bully outside school compound. I hated many things that people had done to me both verbally and physically, and perhaps the past that Pastor was talking about, was my unforgiving self. But all glory to God, that now I have found courage to forgive people by God's grace! I have also found a home in Acts, and most importantly, peace in my heart for me to root in this church. Thank you Lord. Definitely looking forward to Acts London now! God bless Acts London!